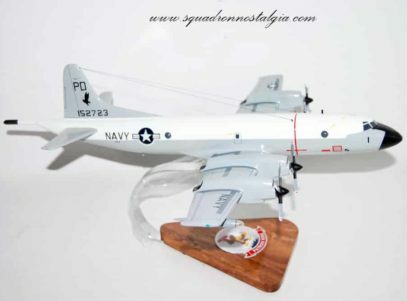 A meticulously hand carved and painted 18 inch wooden P-3 Orion of the VP-9 “The World Famous Golden Eagles” in a 1968 paint scheme. 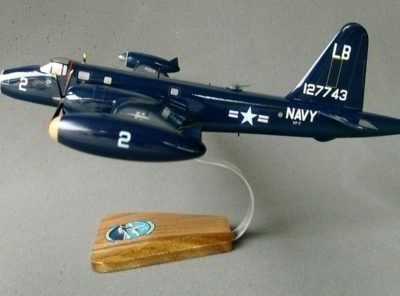 Patrol Squadron NINE was commissioned at Naval Air Station Whidbey Island, Washington, on March 15, 1951, under the command of Commander M.B. Bailey. The new squadron flew its maiden flight in a P4Y-2 Privateer. Within a few months the “Golden Eagles” embarked on their first deployment to Naval Station Kodiak, Alaska. Since that time, the squadron has participated in a wide variety of missions around the world. For the remainder of the 1950s and 1960s, Patrol Squadron NINE participated in numerous deployed operations throughout Asia and the Northern Pacific. VP-9 provided support for night combat operations in the Korean War in which VP-9 P4Y-2 Privateers dropped illumination flares for Marine Corps F7F attack planes to use during strikes on North Korean targets. 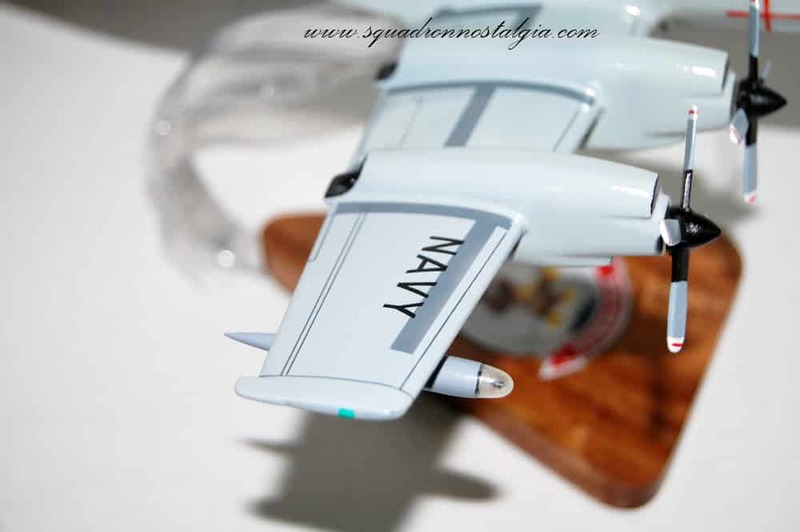 Other significant milestones included: changing homeports to NAS Alameda, CA in 1952, a move to NAS Moffett Field, CA in 1963, transitioning to the new P-2V Neptune in 1953, the P-3A Orion in 1963, and the P-3B Orion in 1966. While deployed to several locations in Alaska in 1958, the squadron flew polar scouting missions for the USS NAUTILUS’ historic first voyage under the polar ice cap. 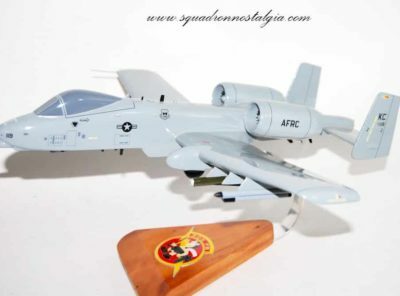 From 1963 through 1972, the squadron deployed to Okinawa; the Philippines; Kam Ranh Bay, Republic of South Vietnam; U-Tapao, Thailand, and Guam in support of Operation MARKET TIME and other operations during the Vietnam War. In1970, while deployed to Marine Corps Air Station Iwakuni, VP-9 earned its third Meritorious Unit Commendation for patrolling more than nine million square miles of ocean, ranging from the Arctic Ocean to the Philippine Sea, and, in the following decades, saw deployments covering over three-quarters of the globe. In 1976, VP-9 began a new era of maritime patrol aviation with the squadron’s transition to the computerized and upgraded P-3C Update I. In November 1986, VP-9 became the first squadron to deploy to the Western Pacific area of operations with the APS-137 Inverse Synthetic Aperture Radar (ISAR). 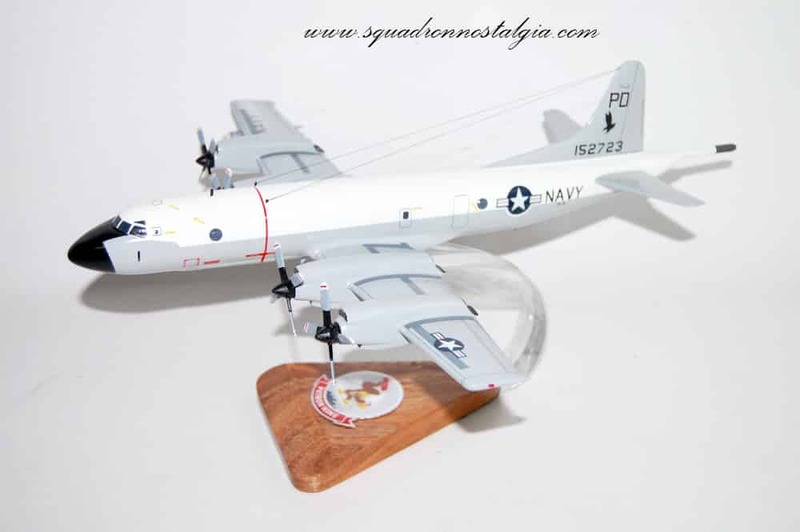 The P-3C Update III was introduced in 1990, expanding the mission capabilities of the squadron. In 1992, Patrol Squadron NINE moved to a new home, NAS Barbers Point, Hawaii. During the 1997–1998 Inter-Deployment Training Cycle (IDTC), the “Golden Eagles” were chosen to spearhead the Fleet introduction of the Anti-Surface Warfare Improvement Program (AIP) P-3C aircraft. Among other improvements, the state-of-the-art AIP aircraft includes a comprehensive upgrade of aircraft sensors and command, control, communications, computers and intelligence (C4I) capabilities. 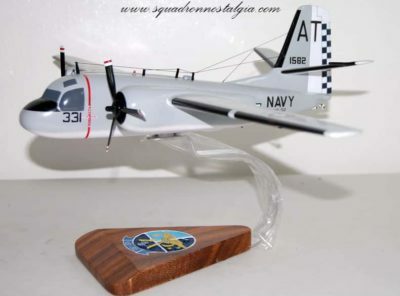 In recognition of the highly successful deployment and introduction of the new AIP aircraft, VP-9 was awarded the 1998 Coastal Command Trophy. VP-9’s Maintenance Department also earned the prestigious AVCM Donald M. Neal Aircraft Maintenance “Golden Wrench” Award for sustained maintenance excellence. After the successful initial deployment of AIP to both FIFTH and SEVENTH Fleets, VP-9 again made history with the launch of a Standoff Land Attack Missile (SLAM) during Fleet Battle Experiment ECHO at Point Mugu, CA on April 14, 1999, the first such launch after in-flight target reprogramming. In addition to the normal IDTC requirements, the “Golden Eagles” made a fifth homeport change to Marine Corps Base Hawaii Kaneohe Bay in May 1999. VP-9 was the first Patrol Squadron to operate from Kaneohe Bay, hosting the multi-national ASWEX and JTFEX 99-1. The “Golden Eagles” proved their Under-Sea Warfare (USW) prowess when they were called upon to locate and track a real-world target, during Operation PHANTOM MENACE, which resulted in the most successful theater USW prosecution in recent history. In recognition of its USW expertise, VP-9 was awarded the coveted Captain Arnold Jay Isbell Trophy for USW Excellence for 1999. VP-9 began an impressive winter deployment to the Western Pacific area of operations in December 1999. The “Golden Eagles” flew operational missions from Misawa and Kadena, Japan and established detachments throughout the Pacific theater in support of various Fleet operations and exercises. While operating from these various sites, VP-9 provided an unprecedented level of support to Commander, SEVENTH Fleet; the USS STENNIS and USS KITYY HAWK carrier battle groups, as well as the USS BELLEAU WOOD amphibious ready group. The squadron also successfully flew in numerous undersea, surface, and amphibious warfare exercises. 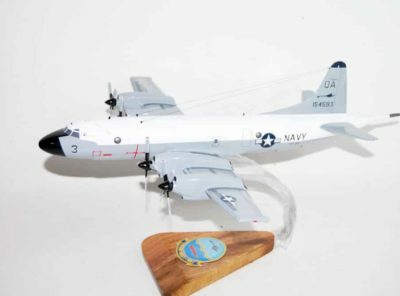 The squadron employed the sensors and capabilities of the P-3C AIP aircraft throughout the Western Pacific theater in support of Fleet, theater, and national tasking. VP-9 returned to Hawaii in June 2000 and immediately began an immensely successful Inter Deployment Training Cycle (IDTC) with a coordinated Harpoon anti-ship missile shot during RIMPAC 2000. That fall, the squadron assumed the CTF 12 Ready Alert mission and flew a successful search-and-rescue (SAR) mission that rescued two men at sea. In addition, the squadron won Best Aircrew and Battle Group Honors during the annual ASW Rodeo exercise, called Operation WOLF HUNT, held at North Island, CA. 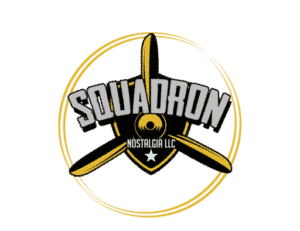 In December, the squadron sent a detachment to NAS Fallon, Nevada in support of Carrier Air Wing TWO’s strike training and flawlessly employed the newly-arrived AIP capabilities of the P-3C Orion in the role of precision strike targeting. These operations enabled VP-9’s successful launch in January 2001 of an AGM-84E Standoff Land Attack Missile (SLAM). 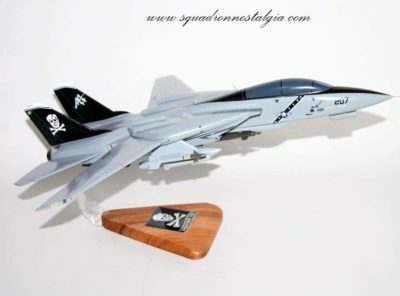 In June 2001, the squadron again deployed to the FIFTH and SEVENTH Fleet areas of operations, working from three locations: Diego Garcia, British Indian Ocean Territory; Masirah, Oman; and Bahrain, as well as small detachments to Jeddah, Saudi Arabia, the Seychelles Islands, and Kuwait. In August, the squadron established a temporary detachment in Australia in support of Anti-Submarine Warfare exercises. After September 11, 2001, the “Golden Eagles” transformed the Maritime Patrol and Reconnaissance community by flying armed Battle Force Support flights from Masirah, Oman and Diego Garcia to protect local populations and resources. When Coalition forces began direct action missions against the Taliban, VP-9 flew missions over Afghanistan which included imaging, long range targeting, armed surveillance and reconnaissance, strike missions consisting of SLAM attacks, and battle damage assessment. The “Golden Eagles” continued to support Operations SOUTHERN WATCH and ENDURING FREEDOM, flying over 1500 flight hours in support Operation SOUTHERN WATCH and over 3000 flight hours in support of Operation ENDURING FREEDOM, including over 100 combat missions. Two of such missions were strike missions directly targeting Taliban and al Qaeda forces, a first for a MPR aircraft in that AOR. In all, VP-9 flew over 1100 missions with an amazing 99.5% mission completion rate. As a busy year ended, VP-9 won the 2001 Battle “E” Arleigh Burke nomination, was recognized by COMSEVENTHFLT for airborne surface warfare excellence, and received the CNO Retention Excellence Award. The “Golden Eagles” were extremely busy in 2002 and 2003. Following a successful Middle East deployment, the squadron immediately returned to the business of training for next deployment, drafting two Optics lessons-learned and integrating its IDTC with that of the 3rd Marine Expeditionary Force in Hawaii. In March 2002, VP-9 wrote three SLAM tactical documents based on those Middle East experiences that have become building blocks for SLAM operations for all MPRA deployers. In April and May of 2002, the squadron participated in JTFEX 02-2 and the first Multi-Integrated Team Training exercise. These events showed the forward fighting capabilities, weapons flexibility, and missions of the P-3C Orion. In addition, the squadron received BZ’s for their efforts in personnel retention excellence from Commander, Patrol and Reconnaissance Wing One. As summer approached, the squadron found itself immersed in Fleet Battle Experiment Juliet in San Diego and RIMPAC 2002 in the Hawaii OPAREA. VP-9 was awarded three BZ’s from CPRFP for its efforts in making the RIMPAC exercise the most successful to date, for participation in USWEX 02-3, and for its superb efforts in locating a kayaker who had been lost at sea in July. In December 2002, the “Golden Eagles” left Hawaii for a demanding, dual-site deployment to the SEVENTH Fleet AOR. VP-9 performed extraordinarily well, supporting Operation ENDURING FREEDOM – PHILLIPINES (OEF-P), Operation IRAQI FREEDOM (OIF), and multiple joint exercises. Joining the Global War on Terrorism, VP-9 provided near real-time imagery to the intelligence community during OEF-P. The “Golden Eagles” demonstrated their expertise in the utilization of P-3C AIP systems throughout the 55 sorties and 670 flight hours over the Philippines. Continuous support of OIF was also critical due to increased force protection in the SEVENTH Fleet AOR. OIF participants were escorted by VP-9 aircraft en route the FIFTH Fleet AOR. Over 230 hours of support was provided for the USS CONSTELLATION and USS KITTY HAWK Battle Groups, USS BOXER ARG, PACSAG, and JMSDF surface vessels as they transited through the Straits of Malacca in Southeast Asia. Operating from detachment sites spread over the Pacific theater, the “Golden Eagles” participated in 28 intra-service and multi-national exercises, four real-world ASW prosecutions, and nine search and rescue (SAR) missions. Exercises such as the Indian SAREX, FOAL EAGLE in South Korea, TANDEM THRUST in Guam, SEACAT and MERGATE in Singapore, COBRA GOLD in Thailand, two PASSEXs in Japan, and eight TYCLONEXs in Thailand strengthened our ties with friendly nations and projected U.S. presence abroad. VP-9 also demonstrated its ASW capabilities by flying over 291 hours on a real-world prosecution of a high-profile target of interest. The Office of Naval Intelligence commended the “Golden Eagles” for the data collected during these missions. Not only was VP-9 successful in real-world ASW missions, but they also saved nine lives during 29 search and rescue missions. These SAR missions ranged from Guam to Brunei to other areas near the Micronesian Islands in the South Pacific. When the “Golden Eagles” returned home, they had flown over 5900 mishap-free hours with a 98% mission completion rate. In June 2003, VP-9 immediately began an intensive Inter-Deployment Readiness Cycle (IDRC) in preparation for their 2004 FIFTH Fleet deployment, following their return from Japan, the “Golden Eagles” executed over 2500 flight hours and achieved the highest state of readiness for 11 combat aircrews while participating in the USS JOHN STENNIS Strike Group Maritime Integrated Tailored Training Unit Exercise 04-1, exercise SILENT FURY with a Japanese submarine, Mk-54 torpedo tests and evaluations, exercise LIGHTNING THRUST WARRIOR with the Army’s 25th Infantry Division, as well as providing critical range clearing services for CNO-mandated missile tests and evaluations in Hawaii. Finally, the “Golden Eagles” celebrated their 25th mishap-free year and 175,000th mishap-free flight hour. In June of 2004, the “Golden Eagles” deployed once again to the FIFTH and SEVENTH Fleets area of responsibility in support of Operation IRAQI FREEDOM (OIF), Operation ENDURING FREEDOM (OEF), and Operation ENDURING FREEDOM- AFGHANISTAN (OEF-A). During this deployment, the Golden Eagles redefined the operational impact of the P-3C Orion (AIP), conducting overland operations in direct support of Allied combat operations in the Middle East. The primary mission area of Intelligence, Surveillance, and Reconnaissance (ISR) greatly increased the tactical advantage of Soldiers, Sailors, and Marines in the heat of battle fighting the “War on Terror” in Iraq and Afghanistan. Maritime patrol of vital sea lanes continued as VP-9 aircrews kept watch over a huge expanse of 5th Fleet’s AOR, from the Northern Arabian gulf to the Red Sea, the Arabian Sea, and beyond. While maintaining proficiency within the Anti-Submarine Warfare (ASW) and Maritime Patrol (MARPAT) mission areas, the squadron participated in nine intra-service and multi-national ASW/ASUW exercises. The “Golden Eagles” ability to consistently conduct reliable two-way data link provided a constant invaluable maritime patrol impact to the USS JOHN F. KENNEDY and USS HARRY S. TRUMAN Carrier Strike Groups (CSG), as well as Coalition units operating in the Arabian Gulf, Gulf of Oman, and Gulf of Aden in conjunction with U.S. forces. Throughout the deployment, VP-9 aircrew and maintenance teams demonstrated impressive operational expertise, contributing to an impressive 98% mission completion rate and over 3200 mishap-free flight hours. This accomplishment was spread throughout a wide range of theaters, from detachments in Afghanistan, Bahrain, Diego Garcia, and Djibouti, to shorter trips to Australia, India, Japan, Kuwait, the Seychelles, and Singapore. Upon returning home from deployment in December of 2004, the “Golden Eagles” hit the ground running with and extremely busy Inter-Deployment Readiness Cycle (IDRC). Executing more than 800 flight hours in the first few months immediately following deployment, as well as an extremely favorable VP-30 Fleet NATOPS Evaluation Team (FNET) visit has proven the resilience of VP-9’s ability to transition to home cycle without missing a beat. Participating in coordinated operations with the USS CARL VINSON Strike Group to help enhance the Strike Group’s proficiency for an upcoming round-the-world cruise, while simultaneously putting prospective U.S. submarine commanding officer’s to test in the Submarine Commander’s Course (SCC), as well as Operation STELLAR DRAGON, in coordination with the USS LAKE ERIE (CG-70) and USS RUSSELL (DDG-59), VP-9 once again proved its mastery of all facets of maritime patrol. After returning home to MCAS Kaneohe Bay, Hawaii, the “Golden Eagles” of Patrol Squadron NINE began a comprehensive Inter-Deployment Readiness Cycle in preparation for the 2006 FIFTH and SEVENTH Fleet Deployment. 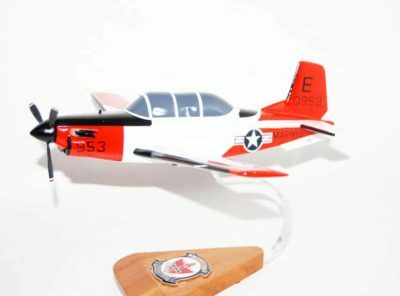 Patrol Squadron NINE flew over 900 sorties totaling 4,000 mishap free hours of flight time and qualified 11 combat ready crews that averaged over 40 qualifications per month. The squadron participated in numerous exercises including 28 events with USWEX 2005. During these operations the “Golden Eagles” worked with the USS CARL VINSON, USS TARAWA, and USS NIMITZ Strike Groups. The Squadron also supported JTFEX and COMPTUEX with numerous detachments to NAS North Island. Patrol Squadron NINE flew 33 sorties for 176 in support of the USS RONALD REAGAN and USS ABRAHAM LINCOLN Strike Groups. The “Golden Eagles” also successfully participated in STELLAR DRAGON, NORPAC 05-01, PACSECEX, and PATROLING THUNDER. Patrol Squadron NINE deployed to FIFTH and SEVENTH Fleet in June 2006, supporting OEF, OIF, and Operation Enduring Freedom –Philippines (OEF-P). From flights overland Iraq to Anti Submarine Warfare (ASW) prosecutions in the Sea of Japan and everything in between, the men and women of Patrol Squadron Nine expertly employed the P-3C Orion to the greatest extent possible, executing over 1,000 sorties, 6,300 mishap-free flight hours, and a 94% mission completion rate. The squadron also spearheaded over 100 real-world exercises and operations in support of Fleet level objectives, and provided over 1500 Strike Group support hours to the USS ENTERPRISE, USS EISENHOWER, and numerous coalition surface units in FIFTH Fleet’s AOR. In December 2006, Patrol Squadron NINE returned home to MCAS Kaneohe Bay, HI. In November, 2007, VP-9 was the first recipient of the ASW Rodeo Belt for having the top ASW performance during the Patrol and Reconaisaince Group wide competition. Congratulations to: LT Bullis (PPC), LT McLean (2P), LCDR Weiss (TACCO), LTJG Hall (NAV/COMM), AME2 Stair (FE), AW2 Tallman (SS1), AW2 Newman (SS2) and AW2 Garcia. VP-9 deployed in May 2008 to Ali Air Base, Iraq in direct support of Operation IRAQI FREEDOM. The Golden Eagles flew over 650 combat missions and 5,000 hours surpassing 30 years of Mishap Free flying. For their operational efficiency and tactical improvements they were awarded both the Battle “E” and the Arleigh Burke Award for 2008. VP-9 embarked on a split site deployment in 2010, this time to the FIFTH and SEVENTH fleet AOR’s. In Japan, operating out of Kadena, VP-9 racked up almost 1,700 flight hours while flying over 150 missions. Meanwhile, at Isa Airbase, crews flew over 750 hours in support of Operation IRAQI FREEDOM. Most recently, in 2013, VP-9 returned home from deployment to tackle an intensive and challenging IDRC cycle. With an 18 month timeline compressed to 12 months, VP-9 showed great resolve, maintaining crew readiness while supporting numerous training exercises and a short detachment to NAS North Island in San Deigo. VP-9 again won the Arleigh Burke Award for 2013 and headed out on deployment to the SIXTH Fleet AOR for a seven month deployment. 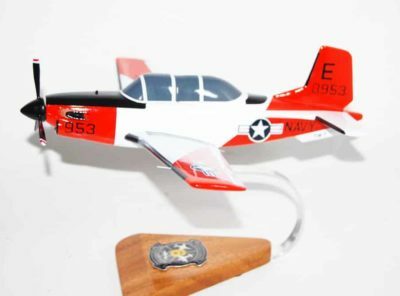 Throughout their history, Patrol Squadron NINE has been recognized with nine Battle Efficiency Awards, four Meritorious Unit Commendations, five Coastal Command Trophies, three Captain Arnold J. Isabell Trophies for USW Excellence, the Golden Wrench award for aviation maintenance excellence, the Navy Unit Citation, and the Golden Anchor. In 2013, VP-9 surpassed a milestone 35 years and 200,00 hours of mishap free flying.